In designing a custom home there are several stages that we will typically go through in collaboration with our clients and our team of consultants. You can meet the team, and we can show you photos of past projects along with materials samples. If your options are numerous, or you're just not sure how to proceed, we can do a small feasibility study which looks at the costs, timelines, and options involved with different development scenarios. A Lanefab representative can give you a detailed breakdown of all the fees that will be required during the design and permitting stages of the project. Typically a small retainer, or 'design deposit', will be paid to get the process started. At the beginning of a project we assemble the site information, including a site survey, an arborist report if there are any large trees to be preserved, and any information available from the city about zoning, sewer, water and power connections. If your project is a renovation, there are some unique steps involved. The first is to generate a set of 'As Built' drawings that capture the existing home as it was actually built. In many cases homeowners have plans from the most recent work that was done, however there are always small differences between the plans and actual construction that need to be captured in the As-Built drawings. Every site and client is unique. We typically ask clients to assemble photos of projects, places, or items that capture the look, feel, or experience that we're aiming to create. These boards can by physical clippings of photos, or online boards using Pinterest or Houzz. Every project has a distinct set of constraints that include the local zoning, the position of the sun and views, proximity to trees and neighbours, and the slope of the land. We will often start a project by doing simplified massing studies where these constraints are tested against a wide range of simple models, or 'massing studies'. The goal of this exercise is to identify one or two shapes that seem worthy of further development while also looking for surprising forms that emerge from the process. Our initial concept work is usually done with both sketching and a 3D model. We like to explore a wide range of possibilities at this stage of the project, and we'll keep working through different options until we land on the one that feels right. Permit drawings aim to convey all of the necessary information that a city reviewer is looking for with regard to both the local zoning code, and the building code. Depending on the city, the permit review process can take anywhere from 6 weeks to 6 months. Depending on the location and zoning of your property, the city may ask for a Development Permit as a precursor to submitting a building permit application. Development permits are typically aimed at reviewing the impact that a project might have on the local community (size, appearance, parking etc.) whereas a building permit is more focused on safety and construction issues. On most projects we work with registered professional engineers to develop a structural plan that meets or exceeds the local requirements for strength, earthquake resistance, and snow load. In some cities, a landscape design is required as part of the overall building permit package. Working with our garden design consultants, we can create a fully integrated landscape and building package on your site. In collaboration with our consultant team, we will typically put together a detailed mathematical model that estimates the amount of energy the building will consume once occupied. For Passive House projects this work goes even further, with an extremely detailed model, shading studies, and thermal bridging analysis. Our design staff and interior designers will work with you to develop a complete package of interior finishes including flooring, tile, cabinetry, lighting, plumbing fixtures and accents. Every project is unique and the final cost will reflect the types of finishes and fixtures that are selected. At the preliminary stage we can approach the budget it two ways: we can design your ‘dream home’ and see what it costs (or) we can set up a target budget and select finishes that will stay within that budget. We'll put together detailed drawings of all of the millwork (cabinetry) showing both the exterior elements, and interior layout, along with specifications for the finishes and hardware. 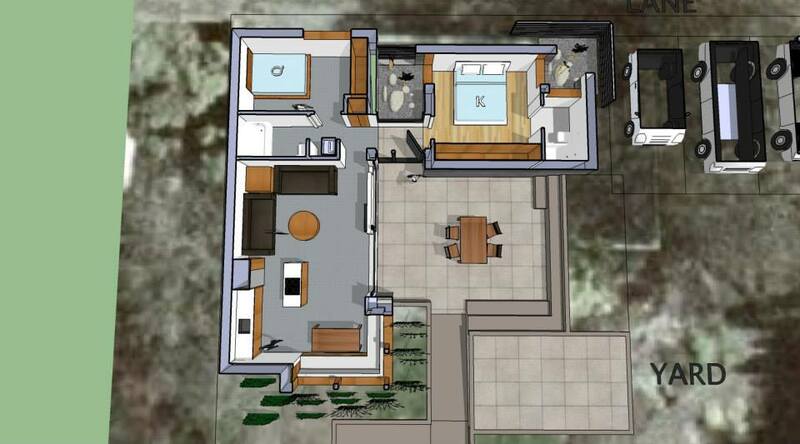 Our interior electrical plans show where all of the lights will be, and where they're switched from. These drawing also show the other features, including appliances, TVs and stereos, security features, home automation, and car charging systems. Our design team will do detailed fabrication drawings for prefab wall and roof panels, and custom elements such as steel stairs or awnings. All of the details that are needed to fully describe the new home are captured in detailed specification sheets that provide for clarity during the construction stage. After the drawings and specifications have been completed we can finalize the overall cost estimate. If a change is needed during construction, the office staff will issue a 'change order' that can be reviewed before the work is done. A typical change order will describe the change being requested, who is requesting it, and what the impact is on the timing and cost of the project.